The T-intersection of Gibson Hill and Crocker in North Albany is often busier than this. North Albany commuters may be glad to learn that traffic experts are looking at the intersection of Gibson Hill Road and Crocker Lane, where making left turns often involves a considerable wait. 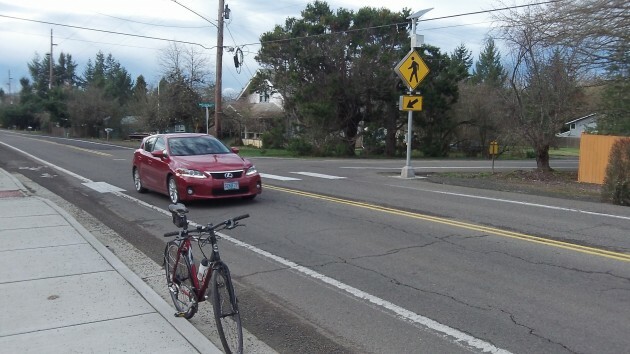 The city of Albany commissioned David Evans & Associates (DEA), Portland, to evaluate five ways of changing the intersection so it can handle traffic more quickly and safely. Ron Irish, Albany’s transportation systems analyst, says these are the options: All-way stop; traffic signal with single-lane approaches; signal with turn lanes; a full-size roundabout; or a mini-roundabout. During the peak traffic period on weekday afternoons, vehicles entering the T-intersection from the three possible directions total about 1,000. That’s expected to increase to nearly 1,300 vehicles by the year 2040 with continued residential development in North Albany. The biggest problem now is making a left from Crocker when Gibson Hill is busy. “The delay for that movement will increase over time due to more drivers wanting to make the movement (because of development to the north) and fewer gaps on Gibson Hill because of increasing through movements from both development and out-of-area traffic,” Irish says in an email. Also, there are frequent delays on Gibson Hill when drivers wait for a gap in oncoming traffic to make a left on Crocker. The DEA report evaluated each option based on how well it would work in terms of capacity, avoiding delays and so forth; its right-of-way impact and cost; and safety. But so far it makes no recommendation. How much are these “experts” costing the tax payers? Sometime in the future a short bridge will cross the Willamette River off of Conser and I-5 at Millersburg Jefferson interchange. That bypass route to Corvallis will then skirt the north edge of Spring Hill Golf Club and follow the low valley west towards Metge and cross Independence Road with a quick shot towards Lewisburg. It was considered decades ago but North Albany was not city, but Benton County. The mess now was avoidable and a lot easier first, not after. Many people living in north Albany wind their way to Highway 20 to turn west for Corvallis. Gibson Hill and Scenic are pretty, but not flat and straight. Traffic turning left on to Crocker probably in fact originated in Corvallis. We will probably wait until those flat areas are stuffed with roads and homes.